(Harrisburg) — In just a few weeks, eggs from an invasive pest will start hatching in Pennsylvania. 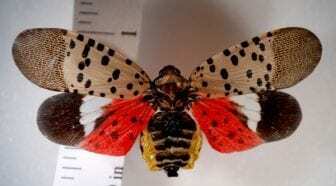 State agriculture officials say now is the time when people can have the greatest impact on the spotted lanternfly’s population. The fly lays its eggs in masses that look like smears of mud on trees, vehicles, and outdoor furniture.